Growing Zones	4-9 Ships	Bare Root Height:	5-6 ft. Width:	5-6 ft. Sunlight:	Full or Partial Blooms:	Summer Spacing:	5 ft. The Only Magenta Hydrangea Gives Huge Blooms for Months The Bella Anna is the newest introduction in the popular "Endless Summer" series of re-blooming hydrangeas. 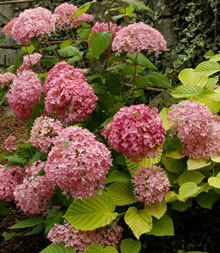 Also known as the "Pink Annabelle", the Bella Anna is the only hydrangea to give you this shade of bright magenta. It's quickly rising to "megastar status" in the gardening industry. As summer heats up, the Bella Anna Hydrangea really turns on the charm. Its dazzling magenta-pink flowers occur in fluffy pom-pom shaped clusters that form at the ends of sturdy stems, generously scattered throughout the rich dark green foliage of the shrub. This breath-taking pageant will run from early summer through fall, stopping traffic and drawing oo's and ah's. The blooms are perfect for bringing indoors and look marvelous when placed in dried arrangements, too. Large vibrant green leaves unfold on well-branched, densely mounded plants. Bella's foliage spreads all the way to the ground, so low-growing facer plants aren't needed to conceal this shrub's legs. Hardy in zones 4-9, Bella Anna grows fast, reaching its mature size of about 6 feet tall with a similar spread in just a few years. Budding on both new and old growth, this flowering beauty responds well to pruning, even blooming more profusely when clipped. Bella Anna flourishes in partial sun to full shade, enjoying moist well-drained soil. Hardy and vigorous, this amazing shrub works well as a colorful foundation plant or when grown in rows as a low hedge, adding definition to a winding path or driveway. Due to its high-octane beauty and its low maintenance reputation, Bella Anna is selling fast! Order yours today, while supplies last. With so much going for it, this easy-to-grow shrub is sure to be a winner in your garden for years and years to come. Sizes vary at time of shipping from 6-18''.